Press Release – Strike Pro leads the evolution of gaming at its best. From the matchless tactile feel of its keys, to the stunning LED backlights, everything in Strike Pro is aimed towards gaming. Sensitivity is not incompatible with precision. Control is not isolated from speed. 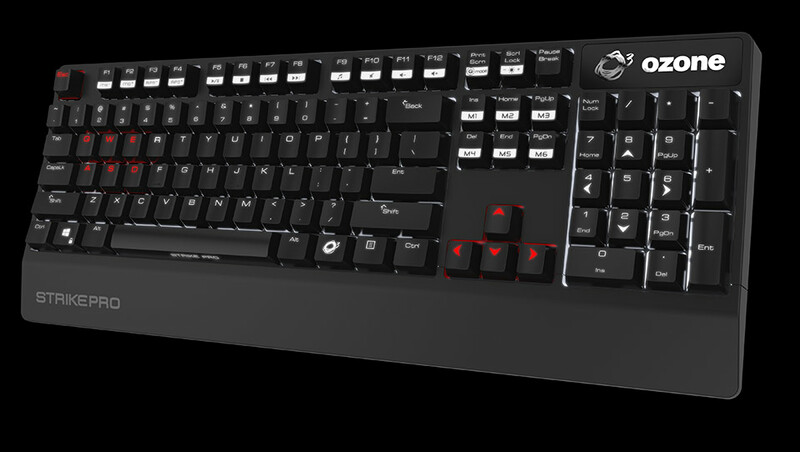 The new Ozone keyboard, Strike Pro, combines sensitivity, precision, control and speed in order to facilitate interaction. Mechanical keyboards have a special and unique sound. 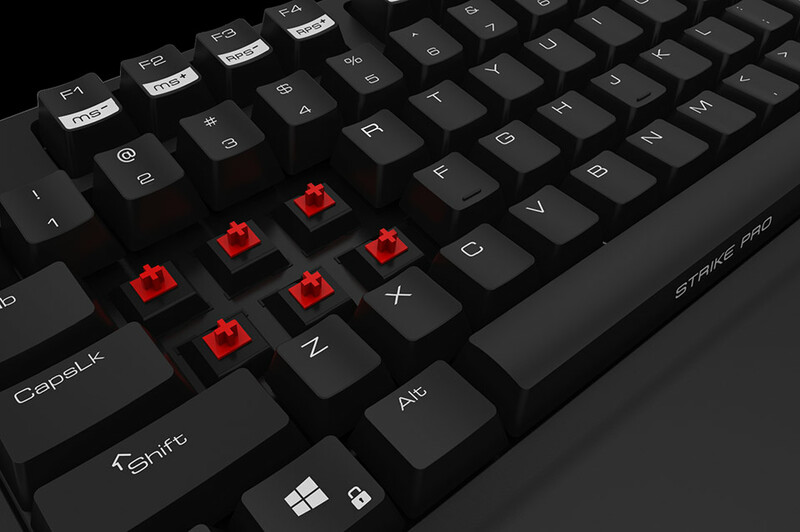 It’s the sound of fast swift keystrokes, it’s the sound of the keyboards response to your expectations as a gamer, it’s the sound of the new Strike Pro. In fact, e-sport professionals have no doubt. “For me there is no other option for a keyboard than mechanical, and there is no other option than the Ozone Srike Pro. Cherry MX Switch, HUB & Audio inputs, LED backlight, good design … So, yes, I have many reasons to choose Strike Pro to my sessions as a professional game,” says Cho “Mata”, Samsung Ozone Team. Turn off the light. Turn on Strike Pro. White LED lighting in normal keys and red LED lighting in gaming keys your fingers will go directly to the right place. Strike Pro can even be configured to only illuminate gaming keys and also adjust the light intensity. Also, during play sessions you will experience maximum compatibility thanks to the keyboards built in HUB & Audio inputs. Strike Pro brings you the possibility to use their 30 macros in five default profiles to suit all gaming styles. Meanwhile, store all your settings safely in the 64k internal memory. 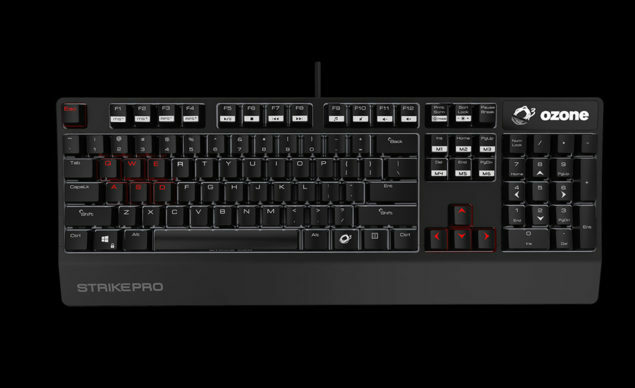 What is the best Cherry for a mechanical keyboard ? : Red? Blue? Brown? Black? It really depends on every gamer, on every use. Strike Pro is available in the four most requested Cherry colors by pro gamers seeking speed and accuracy, an innate characteristics in the new Ozone Strike Pro. You can also configure the response time between the keyboard and the computer from 1ms to 16ms. That said, speed of response and accuracy: Strike Pro, your best gaming partner.